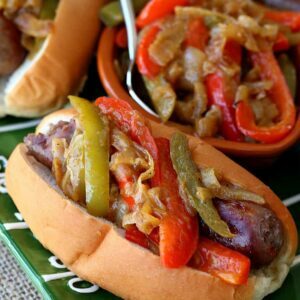 Make Crock Pot Sausage and Peppers for an easy dinner! 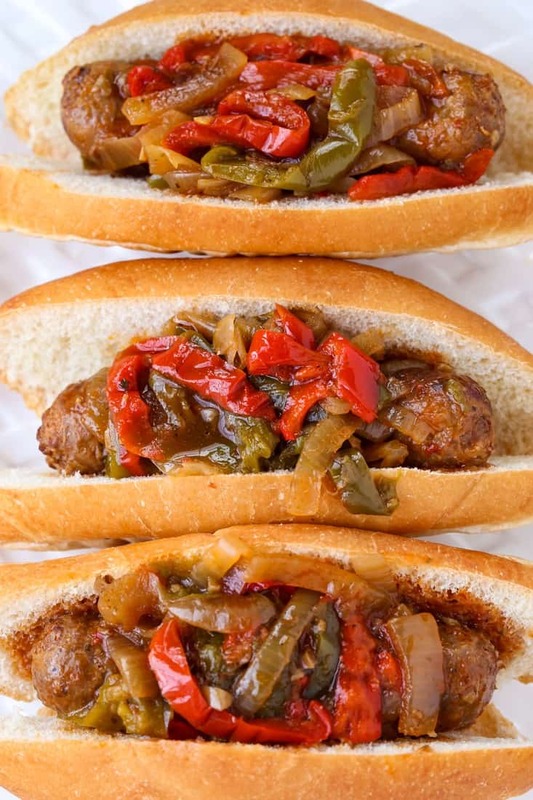 Super tender Italian sausage that you can serve in sub rolls or on it’s own! We love serving crock pot recipes like this for parties too! 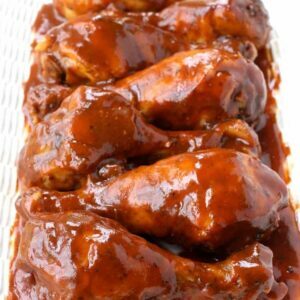 You can also try this Slow Cooker Shaking Beef or one of my favorites, Slow Cooker (Overnight) BBQ Ribs! 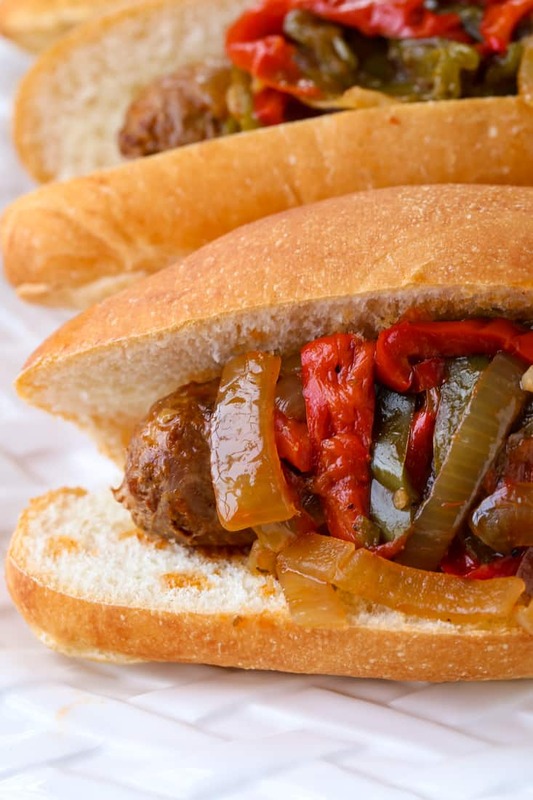 There are a few different ways to make sausage and peppers. One is on the stove top, right in a skillet and another way is to make sausage and peppers in a slow cooker, or a crock pot. I like it both ways, but they do taste very different to me. If you like you sausage to have a snap, then the skillet method is for you. (Recipe coming soon!) But cooking sausage and peppers in a skillet on the stove does require more hands on time while the sausages are simmering. So if you don’t have time for that, then the crock pot method is the way to go. All you need to do is brown the sausages quickly in a skillet then transfer them to a slow cooker along with peppers, onions and the sauce ingredients. Turn it on low and walk away. 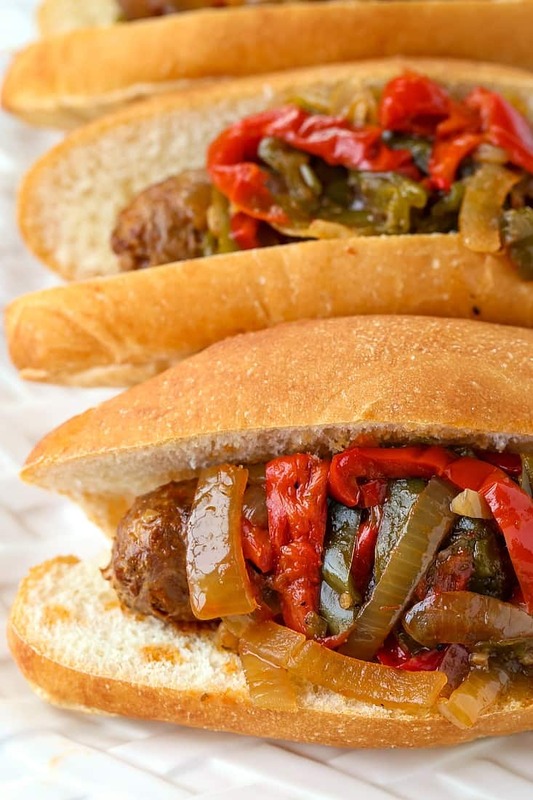 That’s another reason why this crock pot sausage and peppers recipe is perfect for parties! You’ve got other things to do I’m sure, other side dishes to make…so it’s one less thing to worry about. Making sausage and peppers in the crock pot is going to result in a tender, softer sausage. Also extremely delicious and totally hands off cooking. 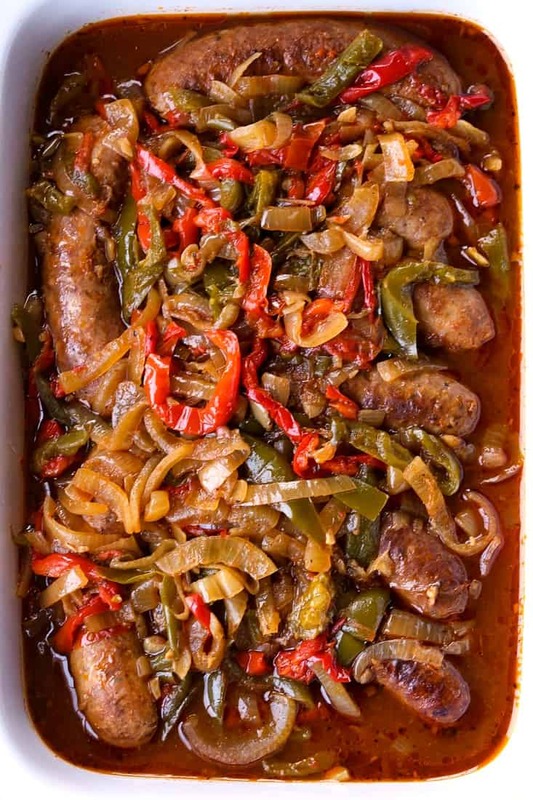 What Can You Serve With Sausage and Peppers? Our sausage and pepper recipe is a little different from a typical recipe you might be used to seeing. Instead of using a tomato sauce or marinara sauce, this recipe is made with a lighter sauce that uses marsala wine and chicken broth. Tomato paste thickens the sauce up a little, but the result is a super tasty light sauce that you can spoon onto toasted sub rolls that will soak up all the delicious flavor. 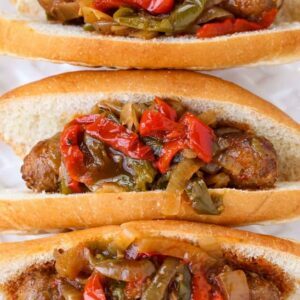 There’s also a few different ways we like to serve these crock pot sausage and peppers, the best way (we think) is on a toasted sub roll with melted mozzarella or provolone cheese. You can have definitely use un-toasted rolls too, with or without cheese. Just be sure to spoon some of the sauce that these sausages cook in onto the rolls before serving. Definitely makes for a messy sandwich, the juice will drip out over the sides of the bun as you bite into the sandwich…but we wouldn’t have it any other way! Looking For More Easy Crock Pot Recipes? This super tender sausage and peppers recipe is perfect for parties or just for a family dinner at home! Brown the sausages in a large skillet using with the olive oil or cooking spray. Cook, turning until the sausages are browned on both sides then transfer to your crock pot along with the peppers and onions. Mix the ingredients for the sauce together in a small bowl, then pour over the sausage and peppers, tossing lightly to combine. Set the crock pot on low for 4 hours. 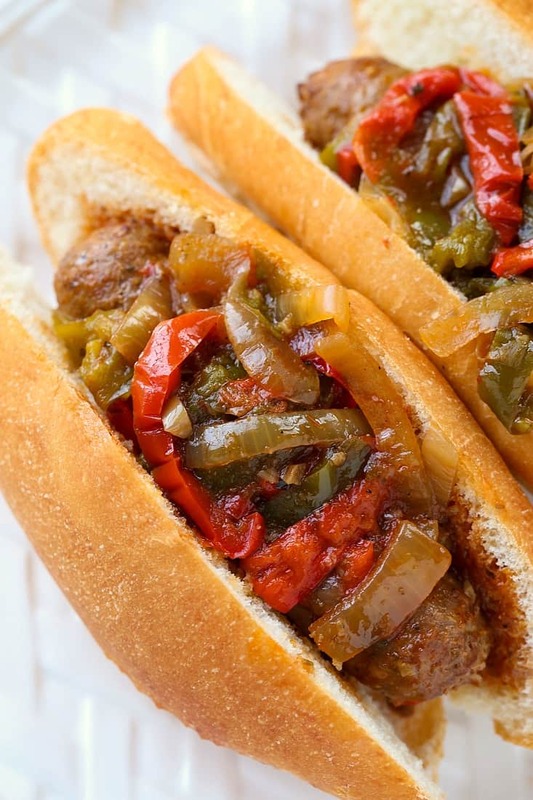 Serve the sausage and peppers on hot dog buns or sub rolls.